Welcome to Pelican Beach #1508! This gorgeous vacation condo is privately owned, and every step has been taken to ensure the luxury that a vacation condo should have, with all the comforts of home. As you can see in the pictures, our condo is modern, and tastefully furnished. Pelican Beach is a family favorite that everyone cannot wait to come back to each year! There are so many amenities that you never have to leave the property, but if you do, there is something for everyone close-by. Take the kids just across the street to "Big Kahuna Waterpark", or over to "The Track" for a day filled with fun and great memories. Charter a fishing boat or enjoy a glass bottom boat excursion out into the Gulf where dolphins swim right up to the boat. You couldn't ask for better shopping at "Destin Commons" or "Silver Sands Outlet". Like to golf? The golfing in the area is second to none, and there are several courses within minutes of the condo. Right here on the property you can eat breakfast, lunch or dinner at Pelican Beach Café, or have a refreshing drink at the Beachside Tiki Bar both open seasonally. Enjoy a good book on the beach as you watch your children play in the gently rolling surf. Need a little time away from the kids? Pelican Beach Resort has seasonal children's activity programs which run Spring Break and Memorial Day through Labor Day. There are many great restaurants nearby, we could not possibly list them all. We suggest checking out a few of our favorite places like "Another Broken Egg" for a breakfast you will not soon forget. For lunch or dinner we recommend "Fudpuckers" where you can marvel at the sight of live gators and even feed them a snack! Our personal favorite is “Harry T's” where you can sit back and watch the boats roll in as the sun sets in the background. There is nothing more relaxing! Shared. Located approx. 30 feet outside of our door. Dining Room table seats 4 as well as 4 seats at the kitchen counter. Beach service is available March- October, through an independent company at the beach. Beach service is not included with our condo. Trading Ohio Winter For Destin...Wonderful! The condo was nicely decorated, plenty of room for just the two of us. 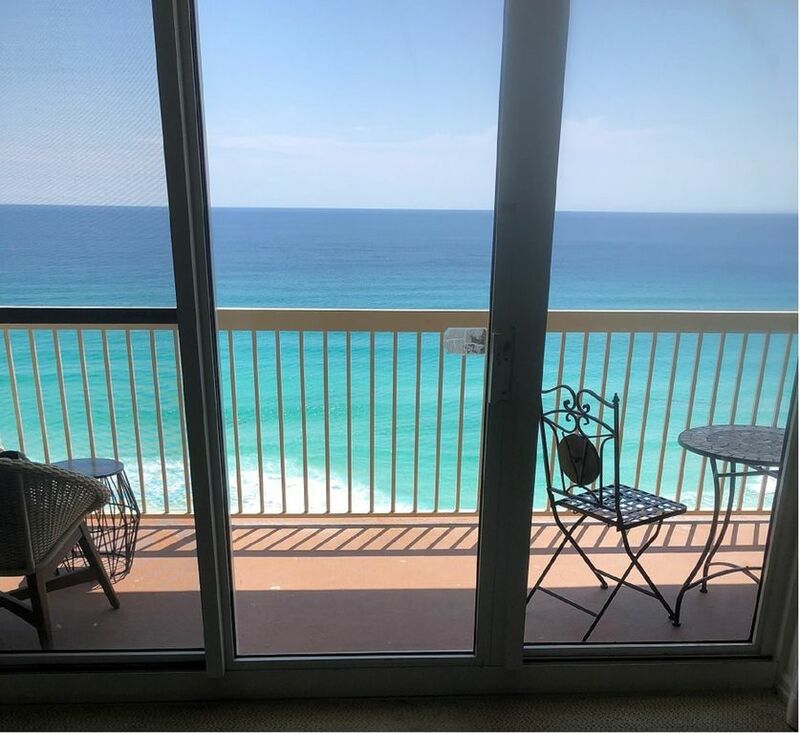 Comfortable king size bed, plenty of towels, kitchen amenities, nice balcony, with a breathtaking, picture perfect view of the Emerald Coast. Rachel was the BEST Host! She responded in record time and took care of whatever we needed. The one thing that might be a problem, especially during busier times, is Highway 98, (this is the only road that takes you to all the restaurants/action). A big part of it is under construction and it is a hot mess! We had a lot of fog during our stay, (month of February 2019). Therefore, didn't have much sun, four days at most, along with four or five afternoon's. The temps were mid 60's-70. However, as my title suggests, escaping our Ohio winter was the best, so I can't complain. Great place! Rachel is awesome. The resort was wonderful, clean, good security. It is very close to the water and just the right size for a resort. The resort is very close to everything. The condo was clean and very nice. The view was amazing. Rachel is awesome to work with. She is quick to answer any questions you may have. You could not ask for a better person to deal with. If there is anything she can help you with, she will. Overall we enjoyed our stay in 1508. The ocean view is excellent. The unit is satisfactory. Could use new or cleaner carpet. The bunk beds are not comfortable so bring an air mattress or a foam mattress top. The couch also is a bit uncomfortable but you don't go on vacay to sit in the living room. The master bed pretty good. Master bath a bit cramped. The pools are great. The in/out pool is heated and very comfortable. The restaurant and tiki bar are nice. The gym is great. The overall appearance is great. The staff are very helpful. Proximity to the beach is superb. Proximity to town also good (will be nicer when the road is finished). We would stay again but not until hwy 98 is finished (2020). Loved the condo. Will be back for sure. Right in the middle of everything in Destin! Very nice and clean!! Loved staying here.